The 22nd year's the charm! A trio of Victoria women have finally won the lottery, over two decades after playing their lucky numbers the first time. 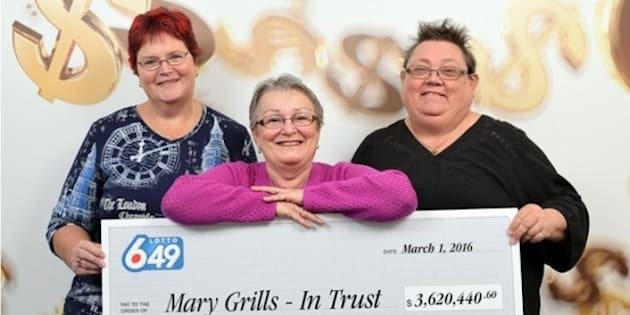 Trish Little, Bex Allarie, and Mary Grills — three longtime best friends — won $3.6 million in the Lotto 6/49 jackpot on Saturday. The trio used the same numbers for 22 years, and only ever missed one draw. "We're still walking around with smiles on our faces," Grills told the BCLC. The women say they're going to retire, travel, and do some shopping with their winnings. As for their winning numbers, Grills said they'll "definitely" keep playing. Last month, Kamloops' Robert Goertzen said he was also going to keep playing Lotto 6/49 after hitting the jackpot with his own special number. He paid $21 for his ticket and discovered he'd won $21 million on Feb. 21.